If you’re a regular reader around here, you might recall that in 2015, I failed miserably at a Bananas Foster bread pudding recipe. It was going so perfectly, but I just had too much moisture going on and it was a big huge soppy mess. The top layer was so good, but under that? Awful. Bananas Foster soup. Not as delicious as you would hope from the sounds of it. I vowed to try again, but where I think I went completely wrong was too many components (there was a brown sugar rum sauce ????) and flavors going together without ever actually trying to make a simple bread pudding first. Baby steps, right? So that’s where we are today: starting small and simple and just sticking to bananas. Let’s master the method first and then get fancy with the ingredients. Bread pudding: another one of those things that sounds weird but is really quite tasty. Obviously, bread is a major component; but that bread is held together with a sweet creamy custard. It’s baked to perfection into a sturdy-yet-very-moist, you-can-still-cut-into-it type of dessert. And the best part? My banana bread pudding isn’t super sweet, so you can totally eat it for breakfast and not feel like you’re making a meal choice that will ruin your day. 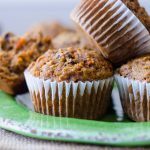 You’ll sweeten naturally with some mashed ripe bananas and my favorite way to bring rich sweetness to baked goods: a bit of brown sugar. You’re also going to use Greek yogurt (along with milk and eggs) for the custard in this bread pudding. Whenever I can get some extra protein into my life, I choose it. More great choices! When it comes to bread pudding, many people like to whip it up as a way to utilize stale bread. While you’re more than welcome to use stale bread (see notes in the recipe for adjustments), I actually used fresh bread for this bread pudding, and it still turned out fantastically. My bread of choice was eureka!® Organic Bread, because it is absolutely jam-packed with flavor and wholesome goodness. 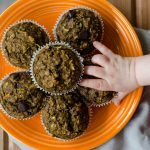 As a texture lover, I prefer bread with “things in it,” much like I prefer crunchy peanut butter to creamy, chunky brownies over basic ones, and homemade granola with chewy bits of tropical paradise. 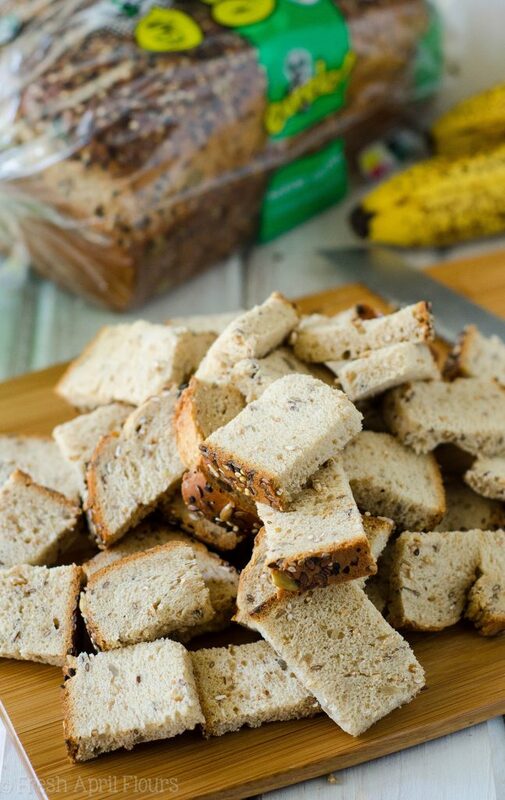 With eureka!® Organic Bread, I got the best of both worlds: choosing a wholesome ingredient without compromising taste or wow-factor. Look at all that texture on the crust and in the bread itself!! You’ll need 10 slices of bread. Feel free to spread the rest of the loaf with peanut butter, jam, jelly, lemon curd, butter, anything and everything to get it in your belly. That bread is a texture lover’s dream! Once your bread is soaked in custard and baked to perfection, you now have the choice of eating it warm or cold. Personally, we prefer it cold, but in a bowl, warmed up with a little extra splash of milk sounds like a perfect nightcap, especially on a cool summer night. Or with ice cream! Or more sliced bananas! This banana bread pudding is just the perfect mix between something like monkey bread and an actual pudding. 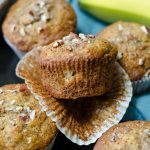 Moist and flavorful bites of banana custard sweetened bread, scattered with crunchy toasted pecans and spiced with cinnamon. And those bites with toasted bread pieces on top? Those ones are my favorite! I think we’ve perfected a basic bread pudding. Take that, 2015! A simple bread pudding made with Greek yogurt and egg custard soaked bread sweetened with brown sugar and naturally sweet bananas. Preheat the oven to 350ºF. Spray a 7x11 (or similar size) casserole dish lightly with non-stick spray and set aside. In a large bowl, toss together the bread cubes and chopped pecans (reserve a couple Tablespoons or so for sprinkling on top, if desired). Set aside. 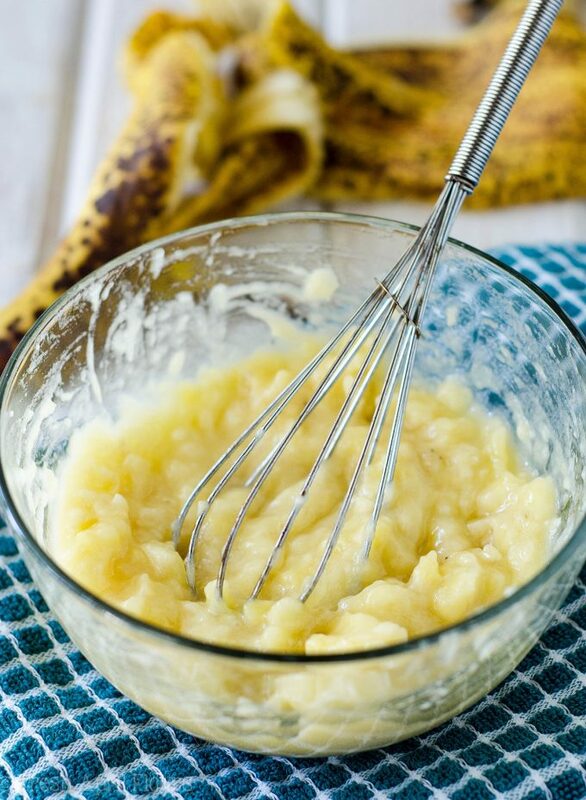 In a medium size bowl, whisk together the Greek yogurt, milk, the 2 mashed bananas, brown sugar, eggs, cinnamon, vanilla extract, and salt until completely combined. Pour mixture over bread cubes and stir gently until all of the bread is covered. Pour coated bread into prepared dish and top with reserved chopped pecans (if you saved them) and banana slices. Bake for 33-35 minutes until top and edges just start to brown or until a toothpick inserted in the center comes out clean. Allow to cool at least 15 minutes before serving, or cool completely and chill in the refrigerator to serve cold. Dust with powdered sugar, if desired. Leftovers can be stored in the refrigerator, covered tightly, up to 5 days. To serve warm leftovers, reheat individual servings in the microwave. *If you are using stale bread, you may want to increase milk to 1 cup. 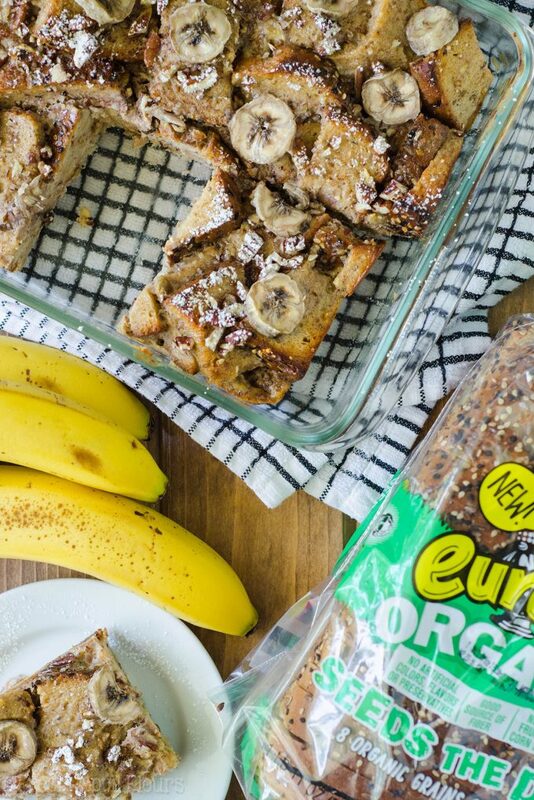 For more information on eureka!® Organic Bread, visit them on Facebook, Twitter, Instagram, and YouTube. What’s your favorite bread pudding recipe? Share it with me in the comments for a chance to win a $100 Visa gift card! 1. Leave a comment in response to the sweepstakes prompt on this post. 2. Tweet (public message) about this promotion; including exactly the following unique term in your tweet message: “#SweepstakesEntry”; and leave the URL to that tweet in a comment on this post. This giveaway is open to U.S. Residents age 18 or older (or nineteen (19) years of age or older in Alabama and Nebraska). Winners will be selected via random draw, and will be notified by e-mail. The notification email will come directly from BlogHer via the sweeps@blogher email address. You will have 2 business days to respond; otherwise a new winner will be selected. 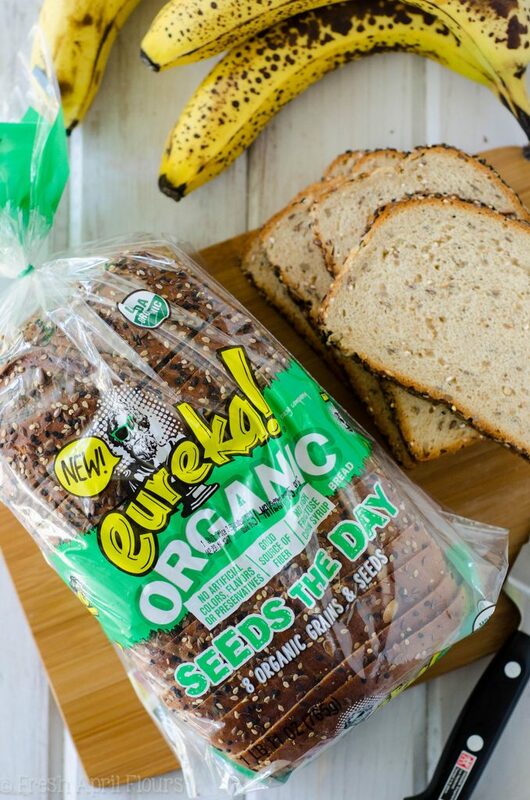 Be sure to visit the eureka!® Organic Bread brand page on BlogHer.com where you can read other bloggers’ posts! I am a SUCKER for bread pudding in just about any flavor/form (Leah? Addicted to sweet/carby things? 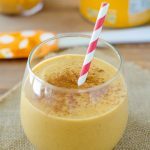 But you never would have guessed 😉 ), and I am loving this protein packed and banana-sweetened spin. Mmmm, Mm! 2015 can totally keep it’s banana foster BP “fail” because this is such a WIN! Hahaha, SERIOUSLY! Although that probably WON’T stop me from trying it out now that I’ve mastered the basics! Watch out, summer. Breastfeeding mama means give me all the bread!! I’ve actually never made bread pudding. I can tell you my favorite sandwich is turkey and avocado! Haha, hey, bread is still involved… I’ll take it! Oh yum! Piña colada-esque! I dig it! I love apple bread pudding with loads of cinnamon! That’s speaking my love language, Natalie! I love cinnamon! First off, I am so pumped to try this out this summer! I’m going to have to go with my favorite dessert + bread pudding- PECAN PIE BREAD PUDDING! My mouth is watering already! That sounds SO GOOD. Now I just want to make all kinds of bread pudding, haha. Honestly I don’t have one. I’ve only ever had bread pudding a few times. A restaurant out here made the best pear bread pudding… Until they changed their menu… ???? I will totally be making this…sometime between newborn things ???? Oh bummerrrrr! I hope you find some time to make this one, Sarah! I don’t have a recipe for Bread Pudding. I’ve never tried to make it before and am super grateful that you shared one for me to try!! My Dad LOVES bread pudding! I remember him making it for our family a few times when I was a kid, but I never got into it. 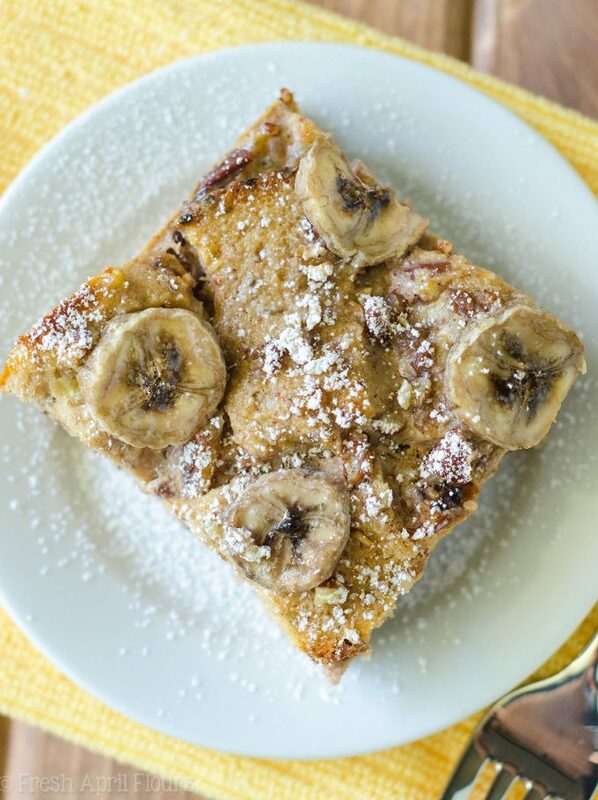 I think times have changed because this banana bread pudding sounds like the perfect indulgent weekend brunch, or dessert, next time my parents are coming over! I know Dad will be a huge fan! Good job Lynn on perfecting this awesome recipe! Thanks, Amy! I think you need to whip up a GF version for yourself to try it out! This looks sensational Lynn! Who doesn’t LOVE pudding! 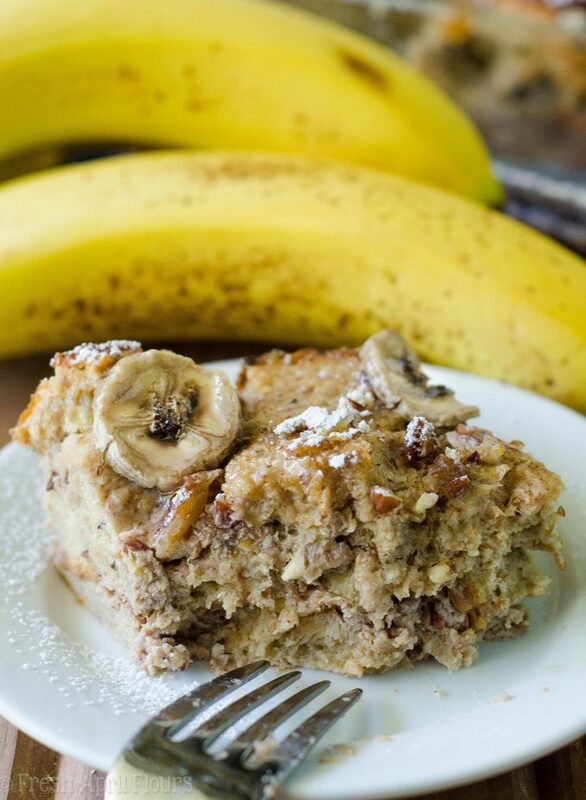 Especially bread pudding with bananas – love! 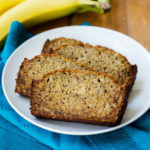 I have never made bread pudding but I do like to make banana bread. How about some Peaches and Cream bread pudding, just in time for summer! Ohhh yeah. I’m down with that one, Brit! I’m all about the sweet & savory. Salted caramel anything gets me every time! I can’t disagree with you there, broski. I don’t recall having too many bread pudding recipes (besides this one), but apple cinnamon bread pudding sounds amazing! My favorite bread pudding recipe has bread cubes and raisins. I love raisin bread pudding with cinnamon. 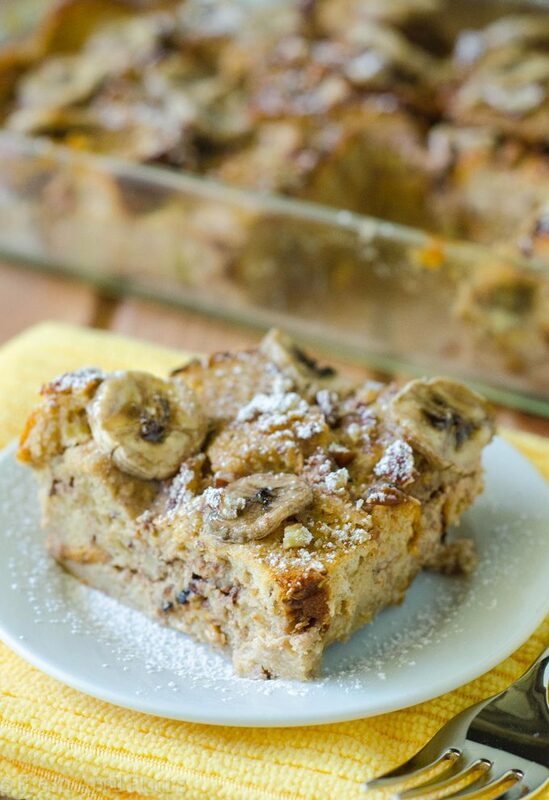 I make banana bread but I would try this bread pudding. Sometimes, Betty just does know best!! My favorite bread pudding recipe is a bourbon bread pudding…omg AMAZING. This looks so good though!!! Ohhh, that sounds so good! Made with actual cinnamon rolls?! That sounds like a dream. My favorite bread pudding recipe is my mother’s homemade one with her secret ingredients. Secret ingredients?! I love that! I like my bread pudding like a twist on apple pie. I go with diced apples, pecans, raisins, cinnamon, nutmeg and maple syrup. I shared on Twitter: https://twitter.com/FireRunner2379/status/741744268428095488. I have never had bread pudding before but your recipe looks really good. My Grandmother made bread pudding with cinnamon and raisins. It had a melted sugar like topping. I haven’t had it in years. 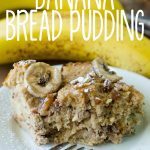 Yours might be my new favorite because I adore bananas, but I’ve always liked a recipe called Bread Pudding with Praline Sauce. It has pecans mixed in a sauce of butter, heavy cream, and brown sugar that is poured on top of the pudding. My recipe for bread pudding is made with bread, butter, cream, eggs, cinnamon and raisins. I like traditional bread pudding with plenty of raisins. Yum! I have never made bread pudding, so no favorite kind. I would use the bread to make croutons for salads. I don’t have a favorite(not a big fan of bread pudding) but this recipe does look good. Eggnog bread pudding, my fave! I have never had bread pudding but this recipe sounds delicious! I don’t have a recipe, but I love bread pudding that has a delicious vanilla bean flavor! Vanilla bean makes everything better! I like a good oat bread cinnamon bread pudding with a hot caramel sauce! banana bread pudding recipe from my sister in law. I have never had bread pudding before! This would be something i would love though because of the bananas! When I make bread pudding, I use vanilla, milk, eggs and cinnamon. Love the banana idea. Thanks so much. I have only had plain bread pudding so I’ll go with that. Love the idea of banana bread pudding! I’ve never had bread pudding – but this looks yummy! I love some gooey brown sugary, melt in your mouth bread pudding. My husband had never tried it before and I made some actually not too long ago, and he loved it. Im not too keen on bananas, but my husband loves them, he would probably LOVE this! 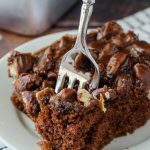 After spending a lot of time in Scotland, I’m a sucker for Sticky Toffee Pudding, and this recipe for a bread pudding version is TO DIE FOR. I have never actually made bread pudding, which is surprising because I like to bake. However, there’s a restaurant we go to that has a sticky toffee bread pudding that is pretty darn delicious. I’ve actually never made bread pudding but I’ve had it before and I loved it with walnuts and cranberries. Mine is Caramel bread pudding! Yum! I grew up eating old fashioned bread pudding so that will always be my favorite. Thank you for the giveaway! I never cared much for bread pudding till I tried Blueberry Bread Pudding and now I love making all kinds of fruity bread puddings. A friend used to make what she called Mexican Bread Pudding, it was extra custardy like flan. So delicious! I’ve only made the classic bread pudding with cinnamon and raisins but this looks really good and I love bananas in just about anything. my mother in law makes it for the family, i’m not sure of her recipe. My mother-in-law makes a great bread pudding with pecans and a brandy-orange sauce. I’ve never made it, but I’ve eaten plenty of it. I don’t have a favorite bread pudding because I have never tasted it in my life. I like the Nutella bread pudding!!! My favorite bread pudding recipe is to mix with a rice to make an awesome rice and bread pudding.